Craigatin House & Courtyard was built in the Highland Perthshire town of Pitlochry in the early 1820’s as a home and surgery for the famous Highland Doctor, Dr. William Stuart Irvine. As far as we know it was used as a private home until the 1960’s when it changed use into a guesthouse. Martin and Andrea Anderson purchased Craigatin House in 2007. 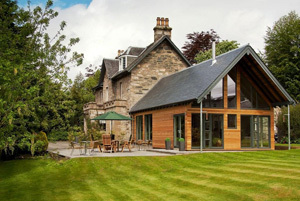 After our purchase, we immediately set about transforming Craigatin House into a boutique bed & breakfast, providing a unique blend of traditional Victorian features with contemporary, modern design. 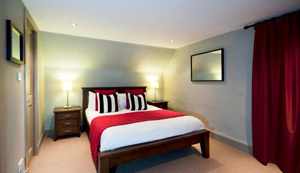 We currently have a total of 14 bedrooms, accommodating 28 guests when full. All of our bedrooms have been fully remodeled and restyled. 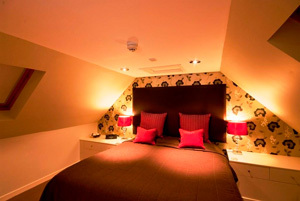 All rooms have en-suite facilities with new bath/shower rooms. 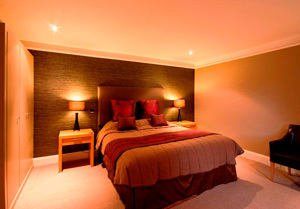 All rooms are individually designed; no two rooms are the same. Our spacious deluxe rooms all have superior six foot wide beds and are decorated with unique fabrics and furnishings. All rooms have large HD LCD TV’s, Freeview and DVD players as well as free wi-fi internet access. We have invested in quality beds, carpets, fixtures and fittings throughout, delivering a quality product to the levels not normally expected in guesthouses. We recently extended the property with the addition of a large dining room and guest lounge. The new dining room has improved our public space giving guests the choice of two dining rooms that are traditional yet modern, bright, light and spacious and a delightful place to enjoy breakfast. We were also able to add a comfortable guest lounge with views to the mountains and gardens all centered on a large log burning stove. Craigatin House and Courtyard sits on a two acre plot with ample private off road parking and spacious grounds for our guests to enjoy. We are centrally located and just a short flat walk to all the bars, restaurants, attractions and theatre.